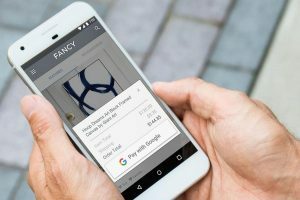 Pay with Google, the online payment portal by Google, has launched in an attempt to speed up and streamline the process of online checkout. Google announced the service’s availability on Monday. Through a blog post, the online search giant said that several apps and websites adopted its payment alternative, and more will be adopting it soon. Online payments are increasing recently and have now become safer due to encryption, fraud checks, and checks on bank cards. However, perfect has not yet entered the equation. Some online shoppers must authenticate themselves each time they make online purchases, forms are required to be filled in, pages then time out, and false fraud alerts prevent a purchase from being made. With each barrier that is placed in front of genuine shoppers, the likelihood a purchase is completed diminishes. If apps, vendors or website domains do have a system that is streamlined in place, and makes purchases a bang your head against the wall experience, consumers might choose to move on to another site to find their item of choice. That in turn annoys buyers and might prevent a return to the site down the line, but also costs revenue to the vendor. Last May, Google released a peek of its new platform Pay with Google, which VP of Product Management Pali Bhat said means flying through checkout without the need to remember and type in multiple lines for payment details. Shoppers can now freely opt to use the Pay with Google platform. Any debit or credit cards that are linked to a Google account through related services such as Chrome, YouTube or Google Play, are available to be used for making purchases online. Google said that it sends the merchant the payment info for the buyer and the shipping address through using information on your account, with no typing required. Then merchants handle the details just like all other purchases. The one step users will need to do is authenticate their purchase, which could mean typing in a security code on a card or verifying who they are through a mobile device. The payment system is able to be used through all Android devices worldwide. Google partners such as Instacart, Wish, YelpEat24, Kayak and Doordash already have implemented Pay with Google, whereas a number of other companies including Just East, Deliveroo, Airbnb and StubHub will implement it soon.